When the Solar Logoi of a System take Cosmic Initiation and are vested with the power to create a System of Worlds, three evolutionary Intelligences are given an opportunity to develop and mature in there: the Elemental, the Angelic, and the Human. The evolution of each one of them differs radically from the other two, but all three, through a cohesive band of cooperative unity work together to the attainment of the same goal. In this respect man seems to be the most dependent for it is from the Elemental Kingdom that he gets his mental equipment, while from the Angelic he receives that of his feelings. The Silent Watcher of our Planet Earth, the Mighty Immaculata, had given us an account of how She, starting as a tiny elemental, with the passing of time, advanced to higher levels and through the process of initiations, She finally reached the exalted Office She is holding now. Her experience, common to Her Evolution, is the course which every elemental must follow to reach higher stages of attainment. As we have seen, they start as microscopic intelligences, so small that millions of them would not take the space of a quarter of an inch. One can see them on the rays of a rising sun, on a clear morning, so small - tiny specks - but as they grow, and this takes time, become Builders of Form, who help create bodies of man, become Nature Devas who build mountains, rivers, lakes, etc., reaching, eventually, the status of a Mighty Elohim and a Silent Watcher of a Planet, a Solar System or a Galaxy. The office of the Maha Chohan is closely associated with the training of the elementals. In fact, they do come under His direct jurisdiction, and in the following, the Maha Chohan Himself is giving us details how that training is done. ". . . My service with the Elemental Kingdom is to train Builders of form. In Temples in the Third Sphere, where the Beloved Venetian assists Me, we teach elemental life to look upon a design - we start with something very small, like the petals of a flower, a blade of grass, a dewdrop, or a snowflake. We, or one of the Builders of Form - make a design, externalize it in the atmosphere before them, and all the elementals in the class endeavor to embody a like form. They try to imitate that figure in a shape, color and design - some of them are very grotesque at first - as they can hold the picture for scarcely a second at a time, when they resume their ordinary shape - but, they are in school and finally there comes a time when they can embody the form of, let us say, an apple blossom. The teacher in the Temple then notifies the Nature Devas that there is a group of elemental beings ready to become the blossoms of an apple tree in someone's orchard - simple! And yet, think of the centuries of training and self-control on the part, not only of the elementals themselves, but of the teacher! Finally, you have a lovely white and pink spring - the apple blossoms smell so sweet and the lovers of spring enjoy walking under the bowers of their beauty - the farmer has hope of a good crop in the autumn - the bees are happy as they make their honey, and the elemental is happy because he has fulfilled his purpose. Then the short season completed, the blossoms fall, and the elemental returns home for commendation, for rest, and reassignment. They are, primarily, mental beings - el-e-mental." There are four divisions of the Elemental Kingdom, each one working under the direction of a Cosmic Being. These are: Earth, Water, Air and Fire. 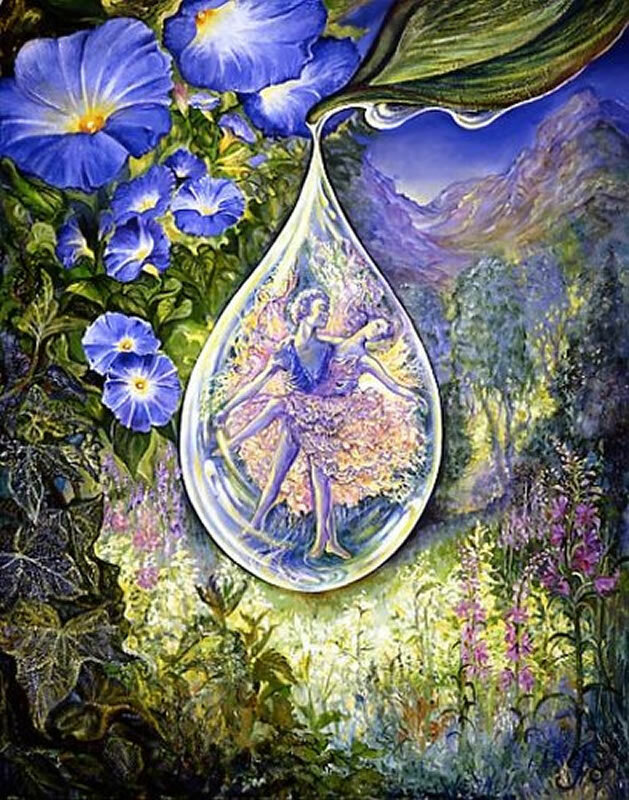 The directing intelligence for the Earth is Virgo, "Mother Earth," and Her Divine Complement is Pelleur. The elementals under Them are known as "Gnomes." For the Water is Neptune and His Divine Complement is Luara. The elementals under Them are known as "Undines." For the Air is Aries and Her Divine Complement is Thor. Their charges are known as "Sylphs." The elemental of Fire comes directly under Helios and Vesta, and Oromasis and Diana, and the elementals for this division are the "Salamanders." In the creation of the Planet Earth, as well as in the creation of other Planets, the services of the Elemental Kingdom come first. They work under the supreme direction of the Seven Elohim and the Builders of Form and it is to them that we owe our mountains, our plains, the rivers, the sea and the oceans, and everything tangible on Earth. When this work is completed, man arrives, accompanied by the Angelic Host, but even then the elementals remain to serve man and keep up the work of Creation. Like man and the Elementals, Angels are God's Creation, and according to Holy Script, they were made a degree higher than man. In preceding pages we saw the beginning of man as a "Spirit Spark," and the elemental as a microscopic "speck." But with the Angels, our knowledge in that direction is much wanting. How they were started we were not told. 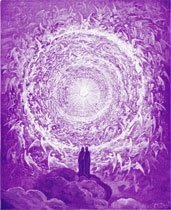 Archangels, Cosmic Beings, and Ascended Masters can and do call forth Angels to assist Them in Their Cosmic activity and service to mankind. 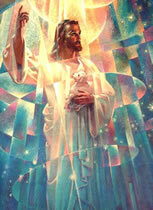 Perfection, love and one-pointed obedience to their Director are some of the main attributes of the Angels. Gradually, and step-by-step, they attain greater power, and following a prescribed line of Initiations, eventually reach the status of Archangels and Cosmic Protectors of Systems of Worlds. In the following, our attention will be concentrated on the Archangels, Those Mighty Intelligences, within the Great Central Sun - Alpha and Omega - Who are already in complete possession of the God Powers of the Father-Mother of the Galaxy, and Who live to do Their will and to radiate Their Light, Their Power, and Their Love to the worlds of Their Creation. When a lesser Sun - in our case, Helios and Vesta - takes on the responsibility of creating a system within the Galaxy, seven of the Archangels with Their Divine Complements, go forth to become the Guardian Presences of all the Angelic Beings, the whole of mankind and every elemental that comprise the evolution of that Sun with Its Planets. In our Solar System, Archangel Michael came with six other Archangels - Jophiel, Chamuel, Gabriel, Raphael, Uriel and Zadkiel - Who form the guard, not only of the Earth, but of the other six Planets and the Seven Inner Spheres which form the Heavens for the Earth. Along with Them came countless legions of Angelic Beings Whose only aim is to fulfill the Archangels wills, which is identical to the Will of the Father-Mother God. Their activity is diversified in the extreme and covers the fields of Protection, Illumination, Love, Perfection, Consecration, Ministration and Invocation - in reality, all the attributes of the Seven Spheres, the Aura of the Almighty. They are the protectors and amplifiers of the Virtues of God, and help humanity through radiation, helping them to continue to place one foot before the other, moving onwards until more help can be given. 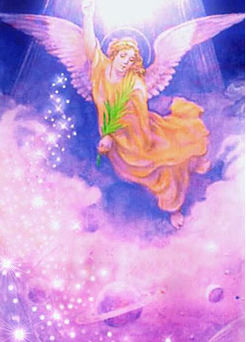 As an evolution, the Angelic Kingdom evolve primarily through the control of radiation and as they advance, become Cherubim, Seraphim, Archangels, and finally great Beings Who guard and protect Planets, Galaxies and large Systems of Worlds. The Archangels reach Their exalted position by first passing through human evolution in any System of Worlds. They start as mere Angels and, like the elementals, grow from the lower rungs of the ladder of evolution by study, work and service. After They reach a certain stage, They do descend into the world of form and like any human being in that particular Planet, work Their way, eventually winning Their Ascension. This done, They return to Their first estate as members of the Angelic Kingdom. Interesting example is that of Mother Mary, Holy Mother of Jesus who originally belonged to the Angelic Kingdom. With Her Ascension, thirty years after Jesus' Ascension. She assumed Her previous estate and is now the Twin Ray of Archangel Raphael, belonging to the Fifth Ray. The Realm of the Seraphic Host is a Realm of Power and the Beings known as the Seraphic Guard are of tremendous stature and the most concentrated strength that the Planet Earth has as yet known. Their faces and bodies are exquisitely beautiful and there is a line in the chin that denotes tremendous strength and determination. In stature, they are from six to fourteen feet in heights; they are guardians of spiritual forces and are always active with the Elohim in the building of planets and spiritual centers on various globes. They belong to both sexes and They are entirely impersonal in Their concentrated power of protection. They move in groups of seven which is always the number denoting creation, and of each Seven Seraphim, one is the leader who moves in the foreground with the three pairs spread out in the shape of a "V" behind Him. When the Seraphim move through the Heaven's or the Earth's Sphere, They emit a while light and many a "falling star" and "shooting comet" that have been recorded by science is but the speedy progression of a group of Seraphim through the upper atmosphere.